Hello Thailand...in full disclosure I wrote this blog post several days ago, however, haven't had the chance to upload it until just now! I will post more about my journey to Bangkok soon! Greetings everyone. Lots to update on since my last Blog post! We successfully made it out of Lucknow, and had a wonderful stay in India’s “Golden Triangle”. Our journey started off in Agra, where we woke up at 530 am to see the Taj Mahal. I’ve read time and again that pictures can not to the Taj Majal Justice, and I could not agree more. 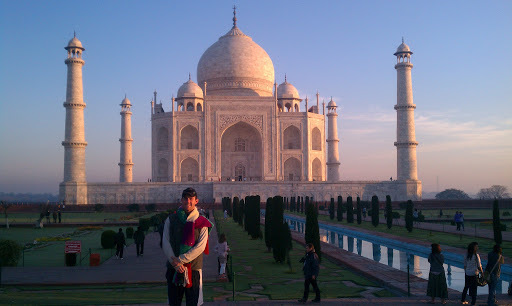 I was blown away by the Taj, and would strongly suggest anyone coming to this part of the world to see the Taj Mahal at sunrise. Without a doubt it is one of the most specatular sites I’ve ever seen. Beyond the Taj, we stopped by the Agra Fort and got some lunch at the Pizza Hut/Costa Coffee before heading the train station. Fortunately our luck with the Indian railway system increased dramatically after day one, and I would highly recommend…granted there was one dicey incident in which a local threw a rock at our train car causing glass to explode all over the place. 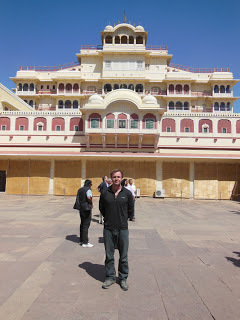 After Agra, we made our way to Jaipur which is known as the pink city. We stayed in a neat little hostel and the owner arranged a tour of the city for us. 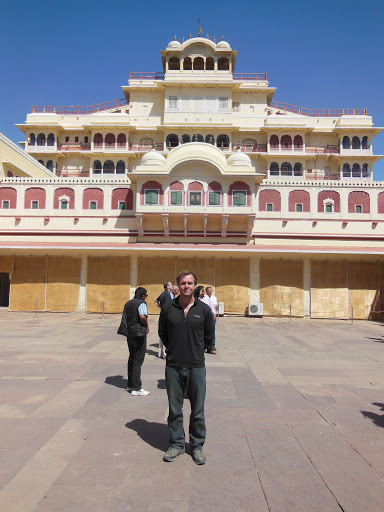 We saw, the Amber Fort, Jantar Mantar, City Palace, and the Hawa Majal. After our afternoon of sightseeing we made our way to the Jaipur train station, where we nearly missed our train to Delhi and Bobby and I were forced to jump on to a moving rail car. This close call was definitely an exciting way to leave this city. We reached Delhi at 10pm, and got out at the train station in Pahargunj. Our hotel was nice all things considered, as this part of town is pretty seedy filled with lots of poor Indians. After sleeping in we woke up and too an adventure to Old Delhi, starting with the Red Fort, followed by a tour of Chadni Chowk on a man powered rickshaw. Our driver was really knowledgeable and brought us around all of the spice and flower markets in old Delhi. We also stumbled across the “camera” portion of town, and I pulled the trigger on a fancy camera for the remainder of our trip. Many of the pictures you’ve seen on this blog are thanks to Ben Heiber’s photo skills, and I can only hope to mimic his skills. After the camera shop we saw some more sites, culminating in Karim’s restaurant for lunch. I was told to come here from Sarah Kaye when she visited Kopila Valley, and her recommendation was spot on. The food was amazing, and Bobby and I both agreed that not only was it the best Indian food we’ve ever had, but some of the best food in general. The following day we hired a car to take us on a tour through New Delhi. The contrast between New Delhi and Old Delhi was enormous, and you could tell quickly that this area was awash with money. Between palatial houses, the government buildings circling the India Gate, and the spotless streets this area was unlike the India we’d seen the day before. Our driver for New Delhi day was awesome and honest, and mentioned up front to us that he would give us a good deal on our tour if we stopped at three stores. In Delhi the drivers get gas vouchers if they bring you to a government store. We did not need to purchase anything, however, by poking our heads in for a few minutes we got a good break from driving and an affordable journey around Delhi. My final thoughts on India (taking into account my brief stay) are that it is not a fun place, however, it is really interesting. Once you get over the intial paranoia that you’re constantly getting conned and get past the congestion, it’s a fascinating place with lots to see and take in. While I would not suggest coming here for a bachelor party, its definitely worth a stop while on life’s great adventure. On the plane to Bangkok right now, and will be sure to update more with some thoughts on Thailand. With respects to the Kopila Kids, I miss them more and more each day and while I’m excited and happy to be on this adventure with Bob I think about my Family & Friends from Kopila and Home constantly.